Polymerization. 2. Monomers. 3. Initiation. 4. Active centres of polymerizations. 5. Propagation. 6. Termination. 7. Transfer. 8. Kinetics. 9. Conclusion. Index. 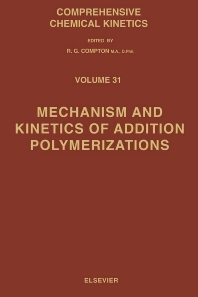 This volume presents an up-to-date survey of knowledge concerning addition type polymerizations. It contains nine chapters, each of which covers a particular basic term. Whenever necessary, the phenomena are discussed from the viewpoint of both stationary and non-stationary state of radical, ionic (i.e. anionic and cationic) and coordination polymerization. Special attention has been paid to the propagation process. It provides not only a general overview but also information on important special cases (theoretical conditions of propagation, influence of external factors, controlled propagation, copolymerization, mechanism of various propagation types, etc.). The book is arranged according to the basic steps in chain reactions, which is a novel approach in a monograph on this topic. It facilitates the identification of common features of various polymerization types which may appear quite different. This useful, comprehensive text should prove invaluable to all those involved in the field of macromolecular chemistry. It will also be of interest to all chemists who, beside the profound study of their own field, are looking for interdisciplinary liaison points.